CLERMONT, Fla. -- A lot of "executive" golf courses have the reputation for being little more than shooting galleries, where beginners try to learn the game while spraying it all over the course and weekend hackers try to work on their short game. 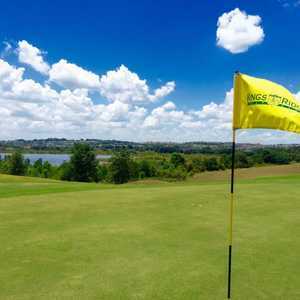 Designed by Ron Garl, the Ridge Course at Kings Ridge Golf Club is more than just a shooting gallery for beginners. Not so on the Ridge Course at Kings Ridge Golf Club. There are only three par 4s on the course, but it's still challenging. And it's next door to the 6,269-yard Kings Course, which is as challenging as any course in central Florida. The Ridge Course is more than just a great warm-up course for the Kings Course or Legends Golf and Country Club, which is right across the street. The Ridge Course offers its own challenges with 15 par-3 holes that feature rises and drops in elevation and some greens that are more difficult than most executive courses. Playing at 3,584 yards from the tips, you won't need the driver. The longest hole is the 381-yard 12th, but the idea for a serious golfer playing an executive course is to work on short irons and mid-irons. A decent drive on No. 12 should leave little more than a mid-iron to a tight green. It really is a true test of golf and a great way to prepare for some of the regulation courses that are close by. Ron Garl, a noted designer in central Florida, designed the course. It's tough from the tips, and the shorter tee boxes don't make things much easier. Mike Corrigan, the golf manager at Kings Ridge Golf Club, said that it wouldn't be smart to underestimate the "executive course." "People want to play the Kings here, but the Ridge is almost as tough," Corrigan said. "We get a lot of play and a lot of people think that this is pretty tough for a small course." For one, the bunkers are large and deep, so missing the green is going to make an up-and-down difficult. It's definitively not a pitch-and-putt course. Getting the tee shot on the green is key on the par 3s. "We like to think this is a tough course for a shorter course," Corrigan said. "If you miss the green you are in trouble." 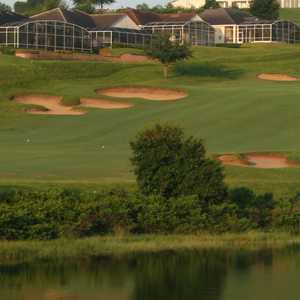 The Ridge offers water, tight landing areas with tricky greens, plenty of pot bunkers, and deep Bahia grass rough, so it isn't a typical beginner course by any means. Playing from the tips, the first four holes are mid-irons, but No. 4 is 208 yards from the tips and plays to a tight green. The fifth hole is the only par 4 on the front side, but at 332 yards, a decent drive should set up a short iron for the approach. The main obstacles on the back side are the two par 4s and the 193-yard, par-3 13th. The course itself offers some nice views. Clermont has the highest elevation in all of Florida, so even though you won't feel like you are in the Rockies, there are some nice views. It also offers a nice warm-up to the two regulation courses close by. 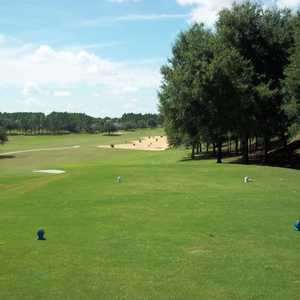 Kings Ridge offers a golf academy and excellent practice facilities, so it's worth a trip from the hustle and bustle of Orlando. "It's a great place to warm up for the other King's Ridge course," said David Alexander of Midland, Mich. "I can't wait to see how my irons work later today." His wife, Doris, said she wasn't a beginner, but she wanted to get the butterflies out before teeing off later at the Kings Course and for the next few days in Orlando. "I'm learning and have trouble with the irons, so it was nice to get through this before I have to start learning how to hit my driver over at the other course," she said. "It was fun and I didn't lose too many golf balls." The 3,584-yard Ridge Course at Kings Ridge Golf Club isn't worth a day trip unless you are looking to tune up for the two regulation courses next door. It doesn't play like most executive courses and offers a great chance to work on the short and mid-iron game before taking on the big boys. It's also a nice deviation from Orlando and flat golf courses. Clermont offers elevation and a nice change of pace for any golf junket.